State schools should not control their own admissions because it increases the risk of cherry-picking of bright pupils, says an influential think-tank. The Institute for Public Policy Research (IPPR) says allowing some schools to run admissions increases social segregation. It says it would be fairer if local authorities ran all admissions, and all intakes were of mixed ability. The government said schools should have an element of freedom on admissions. 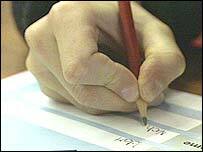 City academies and some faith schools can administer admissions, within rules designed to stop selection. IPPR director Nick Pearce said: "At the moment, schools that control their own admission arrangements are selecting their pupils, and our classrooms are more socially segregated than the local communities outside the school gates." The IPPR wants local authorities to run admissions for all state secondary schools and says the allocation of places should be by "fair banding", under which intakes contain pupils across a range of different abilities. This would mean a shared admissions system across a large number of schools. The think-tank says that schools that act as their own admissions authorities are less representative of the social and ability mix of their local areas. Although there are rules to stop schools selecting, it says that administering their own admissions lets schools operate a form of covert selection - allowing popular, oversubscribed schools to draw a more affluent intake. It says its research shows that faith schools that operate within local education admissions systems are more representative of their neighbourhoods than those that run their own admissions. It argues that faith schools should continue to give priority to children from their own religious community, but alongside fair banding. Mr Pearce queried the value of a re-written admissions code, which was designed to restrict schools' ability to select pupils. "The reforms are welcome but the new system is like asking pupils to mark their own essays, while providing them with detailed rules designed to prevent them from cheating," he said. "Unless the newly strengthened admissions code significantly reduces current levels of segregation, schools should stop being their own admissions authorities. "Local authorities should allocate places and in the long term, every local authority should move towards a system of 'area-wide fair banding'." Schools Minister Lord Adonis rejected that idea, saying that the new admissions rules would stop the cherry-picking. "We agree that ability banding can be an effective way of widening access but we're not going to prescribe that all schools must use it," he said. "Schools should have the power and freedom to set their own admissions policies according to local needs." Liberal Democrat education spokeswoman Sarah Teather said the "important and timely report" supported the party's argument that giving schools complete control over their own admissions was "a terrible idea". "It's extremely embarrassing for a New Labour think tank to criticise the prime minister's flagship policy in this way," she said. "Schools want freedom from government interference, but freedom to set their curriculum and choose how they teach is more important than the power to weed out less desirable pupils."